Today at Senō sensei’s class more people were attending, and we had two hours of taijutsu. It was pure delight. We trained the F. A. S. T. principle in slow motion. F. A. S. T. is my acronym for “Fix And Softly Turn around”. Uke launched a left Tsuki, and you wait until his fist is nearly touching you. At the last moment possible, you pivot to your left, living his fist with your left shoulder. It creates a sort of arm lock as you lock his elbow with your other shoulder. Your body is in line with his arm. Replace your right shoulder by your hand and bring him down with a step forward. The body moves softly and then around the fixed Tsuki. If it doesn’t work, grab the left hand and rotate the body around the arm, creating some omote. 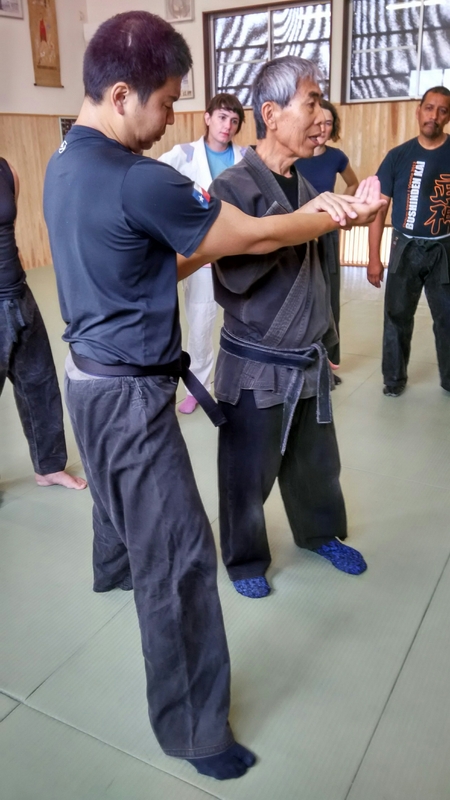 Lift the arm; hit the throat, the face, and then the neck with sunken. A) a Ganseki Nage like movement bend the torso forward to bring him to the ground. If Uke’s left arm gets out of the lock and slides out, your left arm is there to outstretch him and continue. B) a Ganseki Oshi like movement by stepping over with your right leg to off balance uke. Uke’s right arm is pulled horizontally and outside while your left arm lifts his left arm up in Ganseki. Everything is very soft, only done with body footwork. Uke’s body reaction decides on your choice between the two movements. 梃 teko is the lever and 支点 shiten, the fulcrum. What I found remarkable is that the same concept is applied in two distinct ways. In movement A, the teko and the shiten are applied on the same point, here the arm. It is the usual application of the concept. But in movement B, Senō sensei dissociated the two. The lever is still on the arm, but the fulcrum is done by Tori’s right foot, placed on the ground next to the right foot of uke to hinder his movements. I have been playing a lot with this principle, but I never thought of using them in a double location. The applications for it are endless. 3. The “refreshing” part does not concern the heat that was too much.